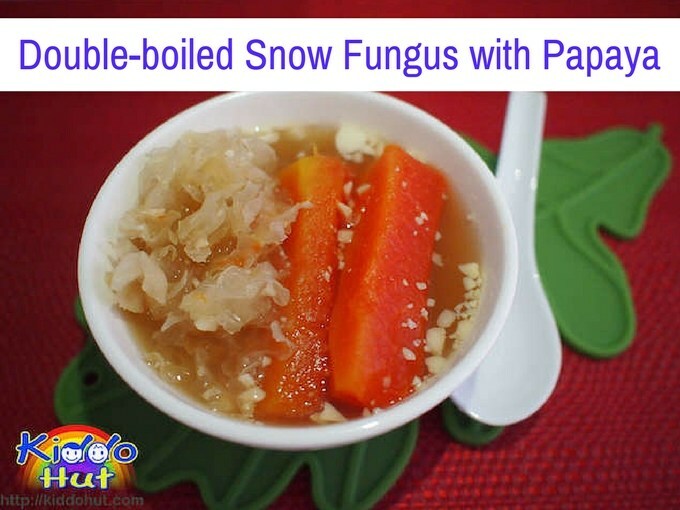 Double-boiled Snow Fungus with Papaya (木瓜炖雪耳) is one of those easy to make desserts with great health benefits. Snow Fungus is also known as Tremella fuciformis. Apparently, good quality snow fungus is pale, yellowish-white colour and has a mucilage-like texture. Snow fungus has been used by Chinese herbalists for thousands of years as tonic herb as well as beauty enhancer to improve complexion. Snow fungus is known to help in fighting infection and inflammation, lower blood cholesterol, protects liver, anti-tumor activity and may slow the ageing process. There are several varieties of snow fungus and I have used two types of the wild grown snow fungus which is pale yellow and light brown colours. You may see some snow fungus sold in the shops are pure white, which have been bleached. I prefer to avoid those. Apparently, the snow fungus from Zhang Zhou 漳州野山雪耳 is of prime quality. It is the lighter brown ones in the ingredient picture. Another ingredients are the Southern and Northern Apricot Kernels 南杏北杏, which are known to be able to stop coughing and calm wheezing, moisten the Intestines and free the bowels frequently used in the traditional chinese medicine. The Northern Apricot Kernels have some bitter taste and mildly toxic. The recommended ratio of the Northern Apricot Kernels to the Southern Apricot Kernels is one is to four. Due to the mild toxicity, do use in moderation and you may wish to skip the Northern Apricot Kernels if serving the soup to Children. For the sugar, you can use the brown sugar slab 冰片糖 or normal rock sugar 冰糖 as an alternative. I prefer some honey aromas chose to use the honey rock sugar which apparently has some health benefits as well. If you do not have a double-boiler and own a slow cooker instead, you can boil the apricot kernels and snow fungus under high heat. After the water is boiling, transfer it to slow cooker, turn to ‘High’ heat and add papaya and rock sugar after an hour later. You may add some Chinese Wolfberries 5-10 minutes before turning off heat. If you happen to buy a papaya that is not yet ripe for consuming on its own, why not use it to cook this dessert? Earlier, I have also posted another dessert recipe that uses Snow Fungus – Snow Fungus Red Date Soup. You can try that too! 1. Wash and soak the snow fungus for an hour or until it is soft. 2. Rinse and crash the southern and northern apricot kernels to release the aroma. 3. Double-boil the snow fungus and apricot kernels for an hour. 4. Add the papaya and boil for half an hour. 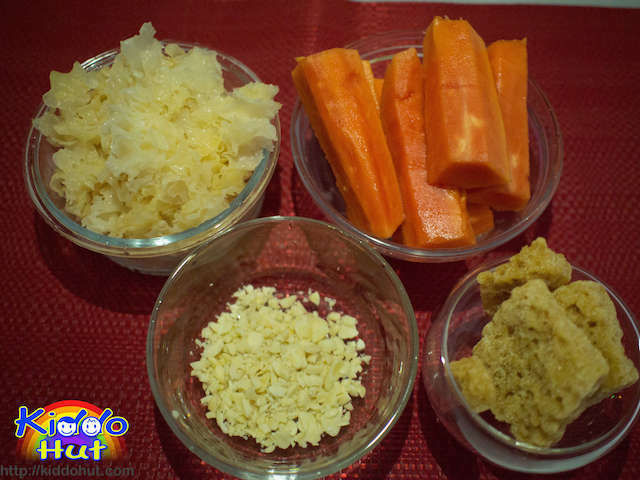 Note: Depends on the ripeness of the papaya to adjust the cooking time for the papaya to avoid the papaya gets disintegrated before eating. If the papaya is not ripe, you can cook it for 1 hour. If it is very ripe, you can shorten the cooking to 15 minutes. 5. Add honey rock sugar to taste. Serve.